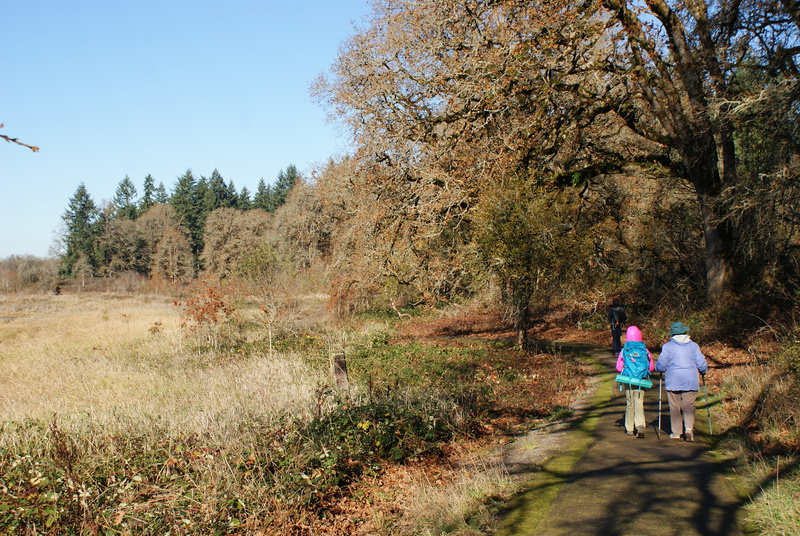 Over the Thanksgiving weekend, we had the chance to visit Ridgefield NWR and do some hiking and birding. On Black Friday we have a tradition of trying to get out into nature. We’ve been doing this even before REI made a big splash and closed their stores on Black Friday, encouraging their employees to Opt Outside instead. 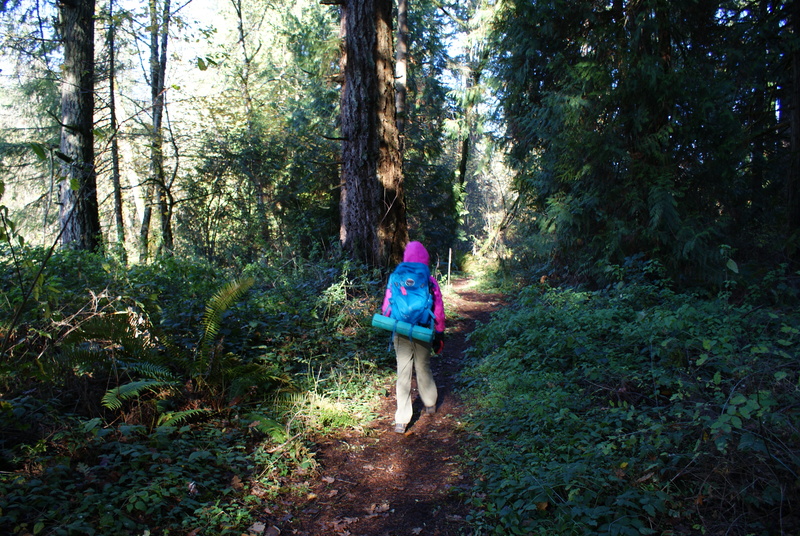 We were thrilled to have sunshine this year, and got to explore some different areas of the Refuge over 2 days. On Friday we walked the Oaks to Woodlands Trail on the Carty Unit (the northernmost section of the Refuge.) The 2-mile loop trail is open year round. 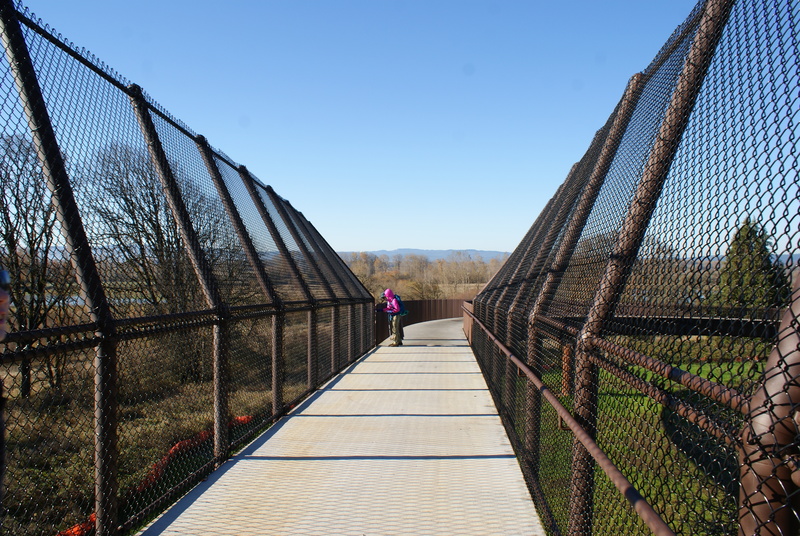 The trail starts out from an ample parking lot and swoops over the railroad tracks on a brand new bridge. Immediately we saw a red-tailed hawk in a tree, and we could hear the Tundra Swans out on the water. We were thrilled to see 2 Sandhill Cranes as well. The trail is gently sloping from there down to a replica of a Cathlapotle Plankhouse that serves as an outdoor classroom. 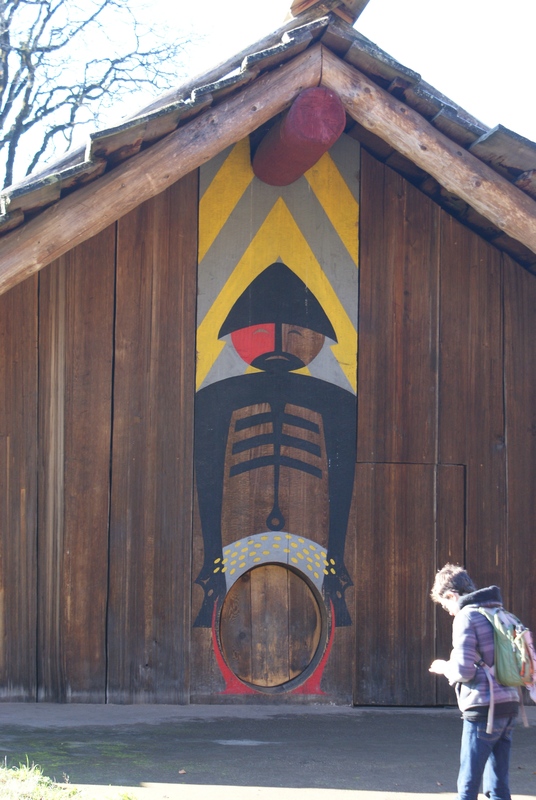 It’s open on weekends in the spring and summer, but we just admired it from the outside. 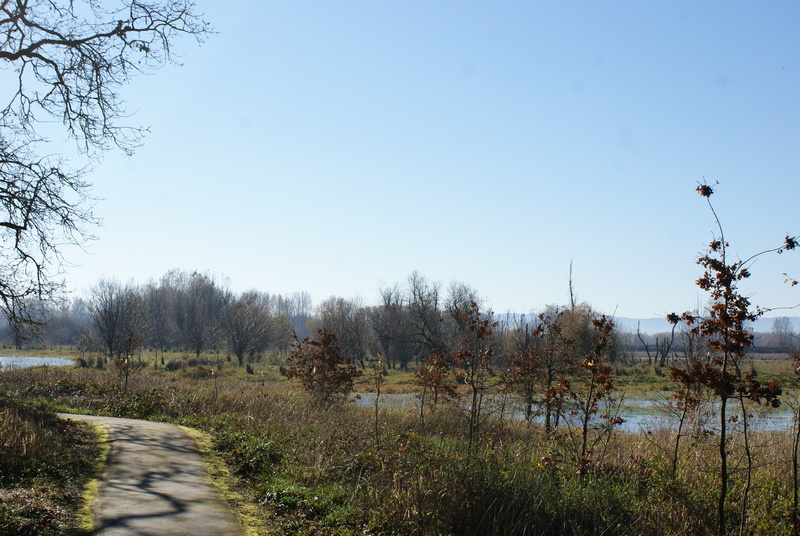 From there the trail winds through the wetlands and oak forests. Parts are paved and parts feel more wild. This feels more like a real trail! We took the loop counter-clockwise. It was frosty in the shade, and we had to put our gloves and hats back on for those sections. 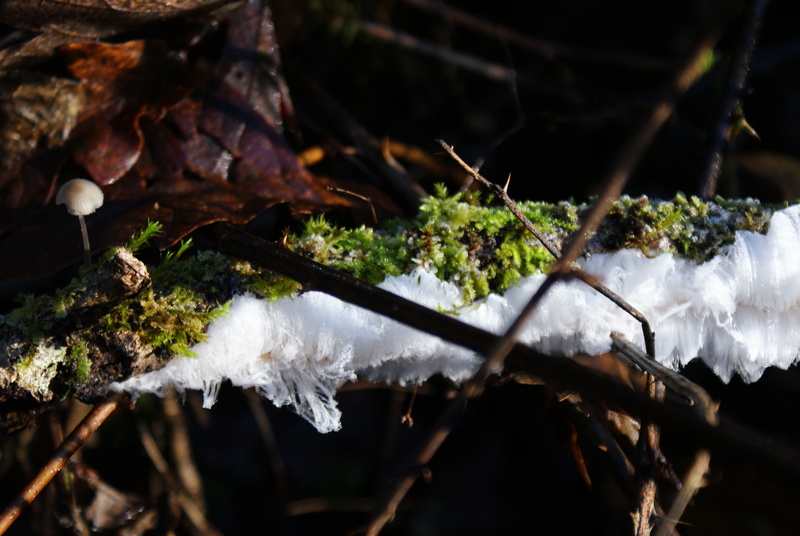 We enjoyed finding little mushrooms, hearing teeny golden-crowned kinglets, and were thrilled to find branches with hair ice. We walked by Boot Lake, where we saw a Great Egret and some other duck-like swimmers that were too far away to identify. 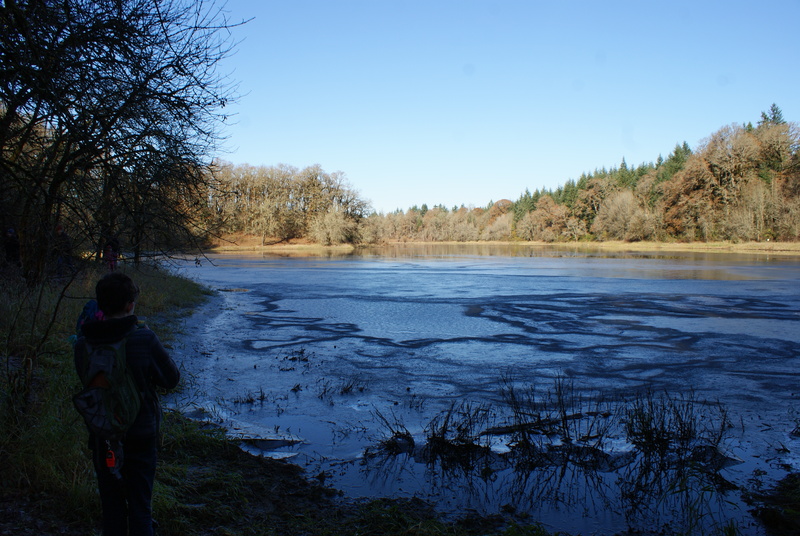 The lake was partially frozen, and when the kids threw rocks, it echoed weirdly. We continued out to the west and took a snack break on a sunny knoll with a view to the south. It was a short walk from there back to our car. On Saturday I took advantage of the free childcare and went back out by myself to Ridgefield, where I drove through the River S Auto Tour Route. 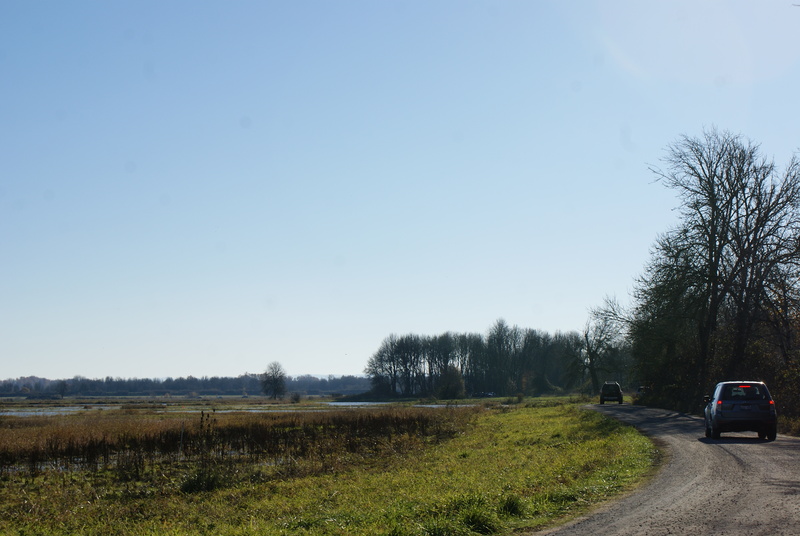 This section is where hunters are allowed to drive through to get to the hunting zones, but other people are restricted to their vehicles from October through April. This lets birders use their vehicles as a blind, while allowing the birds to rest on their wintering grounds. 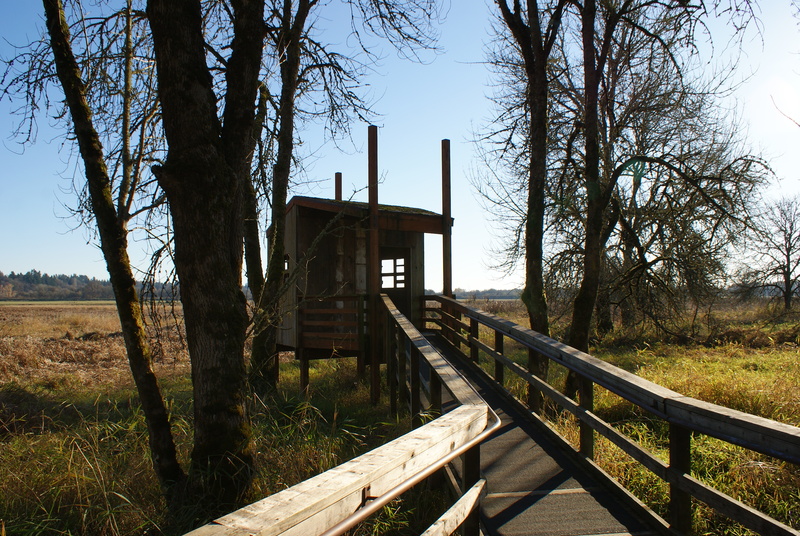 There is one stop where people can get out and walk to a blind, and outhouses are available if needed. I spent over 3 hours driving the route, taking my time observing birds, trying to identify what I was seeing, and looking things up in my book. I had downloaded the podcast from the website (there are also CDs you can borrow from the entrance kiosk) to listen to as I drove the route. I saw multiple red-tailed hawks, northern harriers, coots, dusky Canada geese, tundra swans, and great blue herons. Nutria were everywhere, it seemed. 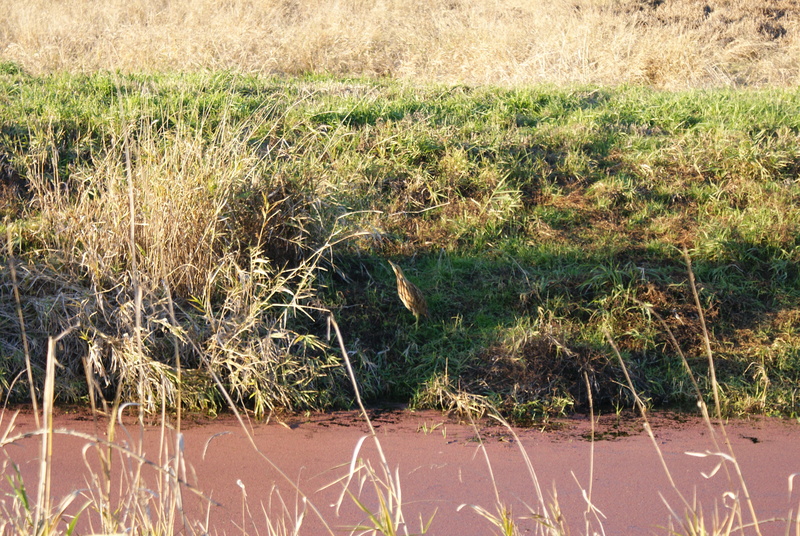 The highlight of the day for me was an American bittern, which sat still in the grass at the edge of a ditch, right next to the road. I almost missed it, but was thankful to be able to watch it for several minutes as it stood still blending in. Its feet, when it walked, were almost neon green. I appreciated the sunshine, and being able to be out without my kids. I ended the day with 19 species, making my total for the year 125. It felt so good to be able to take my time and think my thoughts without worrying about other people. There are some walking trails along this route that I’d like to check out in the summer, too. 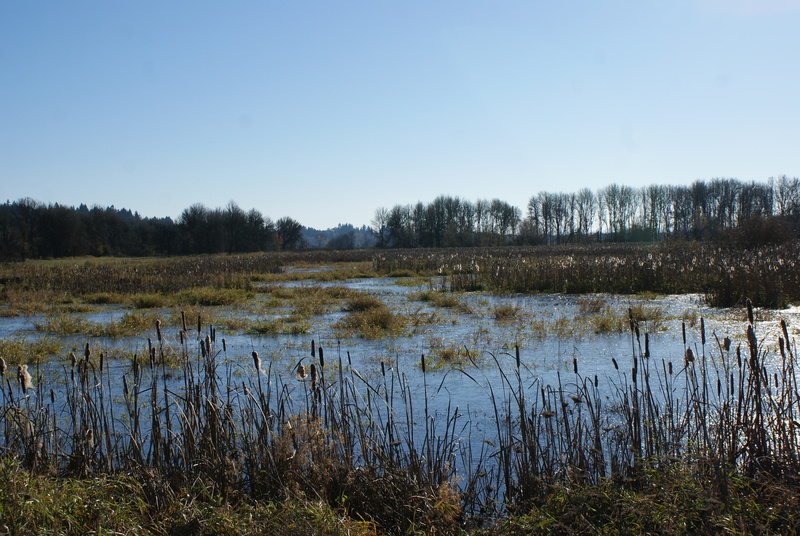 The Ridgefield National Wildlife Refuge is located west of I-5 off of Exit 14 in southwest Washington. I recommend finding directions to each unit on the refuge website. There is a $3 fee per vehicle for visiting the refuge (you can also use a Federal Lands Pass such as the America the Beautiful Pass.) It is open during daylight hours only. Dogs and bicycles are not allowed. You can see more detailed information about the trails here.